Planner Systems: What are They and How do They Work? I’ve spent alot of time thinking about my planner system while writing this series about How to Create the Planner that Works for You. Thinking back to my own (and still on going) journey to finding the right planner for me. What did work? What didn’t? What were the turning points for me on this path? I think that one of the major turning points was coming to the realization that one planner was not working for me. My planner was ending up so full each week that it was becoming overwhelming just to look at. I couldn’t get a good grasp of what the week held for us among all those entries; in short – I couldn’t see the forest for the trees. Something needed to change, because a planner is suppose to help alleviate some of the stress in our lives not add to it. b) help create a routine that would allow me to stay on top of all the things I needed to stay on top of. I loved that planner. It wasn’t pretty, it was just simply functional. I would schedule my day out the night before and block off time to complete tasks. Over time it got more and more crowded. We welcomed Liam into the world, we moved a few times, and as I began to feel more confident in my routines I would add to them. Soon it became impossible to fit all my daily to dos into that weekly planner. With four in the family, keeping track of my own stuff, and everyone else’s was just too much for one planner to handle. Around that time Travis gave me a large whiteboard calendar. (total bonus points to a husband who knows exactly what to get his wife for Christmas!) I loved that calendar like I loved that first planner. And with that addition to our home, I soon realized the power in having a Planner System. What is a Planner System? A planner systems is simply two or more planning tools that you use in conjunction with one another to help you keep track of your time, appointments, and to do’s. 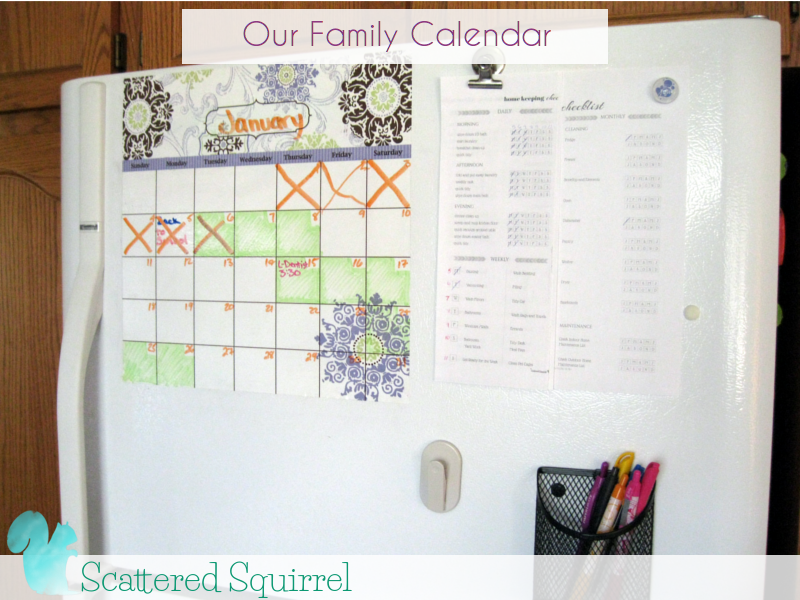 It can be something as simple as a wall calendar and a to do list; Or something as complex as a family command center complete with chore charts and routine checklists. The idea is that you use the tools that work for you to help you keep things going as you want them too. As I mentioned in Day Two (Where Does Your Planner Start) I believe that a monthly calendar is great foundation for any planner. Whether you are just looking at building a planner ‘book’ that contains daily and weekly pages, or you’re creating a whole system like we’re talking about today, a monthly calendar gives you a chance to see the forest and not be distracted by all the trees. But often times a monthly calendar doesn’t afford us enough room or flexibility for the rest of our planning needs. We might need a to-do list to keep track of all the little things we need to get done. Or perhaps we need a day planner to schedule our work days. This is where creating a system becomes essential for planning success. How Does a Planner System Work? Think of some of the more traditional planners you can buy in the stores. In addition to monthly, weekly and/or daily planner pages, many of them now have sections for meal planning, to-do lists, budgeting, shopping lists and more. A planner system is like picking and choosing the sections you need and using them in a way that works for you. Let’s take a peak at my system, and maybe it will give you some ideas. My planner system begins with a monthly family calendar. Even before I fell in love with planners and all they can do for you, I had a monthly calendar. I would use it to keep track of all the big things, like special dates, doctor appointments and the like. I firmly believe having a calendar on your wall, in a place you will see it regularly, is crucial to a good time management system. Whether you’re a large family, a small family, married with no kids, or single, a wall calendar is a great way to make sure everyone knows what’s going on. For me, staying on top of daily routines is super important. It doesn’t take much to throw me off my stride and I have a hard time pulling myself out the spiral into chaos. I may have moved past needing to schedule my house keeping tasks into my daily planner, but I do still need something to hold me accountable and remind that these things need to get done. So I printed off my house keeping check-list and the weekly refill page, and used a magnet clip to attach them to our fridge beside the family calendar. Since I’m in and out of the fridge all day I am reminded often that these things need to get done. And I can see at a quick glance what is left to do that day. The next part of my planner is system, is my planner itself. Over the years my needs and uses for this planner have evolved and it’s had to grow and change to keep up with the times. For the sake of this post, I’m just going to show you the two sections I use in conjunction with the family calendar and house keeping check-lists. First I’m using my full size, two page per month 2015 calendar. This calendar serves as my editorial and maintenance schedule for the blog as well as acting as a duplicate of our family calendar so I can make sure I plan around our family’s commitments. I jot down my posts for the month on those orange post-it flags, that way I can move things around if need be. I used different coloured flags for different things. Then I have a two page per week planner sheet. I used the Family Weekly Schedule as inspiration and tailored it to suit blogging life a little more. Like I said above, I no longer need to schedule in my house work each day, but I do make sure to include reminders to check the house keeping list throughout the day. As you can see, I pull the post-it flags off the monthly calendar and add them to my weekly plan. This again, allows me to move things around and adjust them as need be. It may seem like a lot of steps just to manage my time, but each of these ‘planners’ serves a different purpose and allows me to easily keep our family, home and my blog life on track. It’s far from perfect, and I still have a long way to go towards creating the planner system that works best for me, but I’m getting closer and closer. So a planner system is two or more planning tools that work together to help you plan your time and keep track of all those things we need to do to keep our lives running smoothly. They work because each part serves a purpose or keeps track of one thing. You might have a monthly family calendar that keeps track of appointments and sports and other commitments, and a meal planner that you use to make sure you’ve got dinner under control, and maybe chore charts to help you and your kiddos keep the house up, and a weekly planner that you take with you everywhere to keep your own stuff organized. By themselves, each of these tools is wonderful, together they create a system that helps you stay on top of the thing you need to stay on top of. Creating the planner that works for you is not something that happens over night. It takes time. It takes trial and error. It takes flexibility. What works this year might not work next year. If you have something that is working for you, stick with that. It doesn’t have to be fancy, complicated or even pretty it just simply needs to work. Don’t be afraid to try something new, but also, don’t be afraid to keep the parts that are working. What planners or tools do you use to keep track of your life stuff? I found a great premade planner I like. But I still have a few printables for certain things like meals and checklists. I have add also. I can definitely relate to the scattered feeling. I use a seperate planner at work for just work stuff regularly. Still working on using the home planner regularly, but I am getting there. It’s good to know that I am not the only adult with this disorder. Thanks for sharing. Did it take you a while to get in the habit of using a planner? I love that you use different tools for different areas of your life. You are far from alone, there are many adults out there who have ADD, and many who struggle with it not knowing they have it. 🙂 It took me a few months to get the hang of using a planner, and about a year to really finally figure out that I could use more than one tool to help keep me on track. Like, I could use a cleaning checklist to help remind me of what needed to be done around the house and when and a planner at the same time. It’s been almost 9 years now, and I’m still fine tuning my system. For a long time I got stuck in the trap of trying to make myself work for my planner, it wasn’t until I realized that as life changes so do my planning need, that I really started looking at building a planner that would work with me and how I think/see the world. Give yourself some time and be flexible and open to make changes as need be. 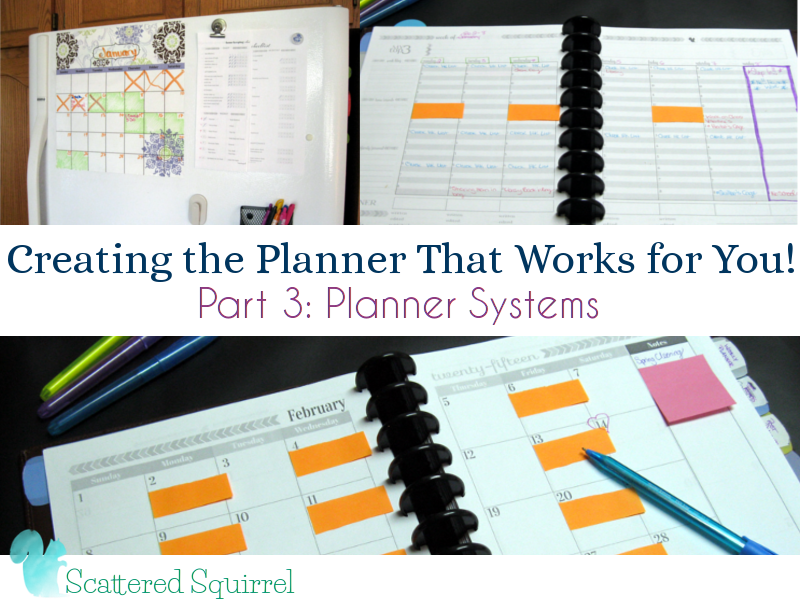 Using printables with a premade planner is a great way to create a system that will work for you. I agree entirely that it may seem like a lot of work and extra fuss to get your planner where it needs to be (monthly and weekly calendars, to-do lists and grocery lists, etc etc), but the beauty of using a planner is there are so many ways to make it work for you! I don’t use my monthly calendar that often, but it’s the only way I will remember birthdays and that I need to give my pup a heartworm pill each month. I add a few things here and there throughout the month, but it’s one peice of paper to remind of a few things…why not keep one? Vive la difference! Some of the components of planner systems will be found in all planners. What does not lend itself to “planner peace” should not be kept. After 30+ years using a planner, I can attest to that. My planner has changed over the years from one that centered on work to what I use it for today; tracking bills, appointments, due dates, medication refills and the family things that I know I will not remember. I also live with ADD, but with the help of a knowledgeable counselor who also lived with it, I found tools, tactics and strategies that get me past many of the typical problems that are part of ADD. I got over “I don’t have to write that down because I will remember it.” a long time ago. Like you, I keep a few blank notes pages in the planner and a small notebook when I am not carrying the planner. I deliberately set out to find components that will work for me. 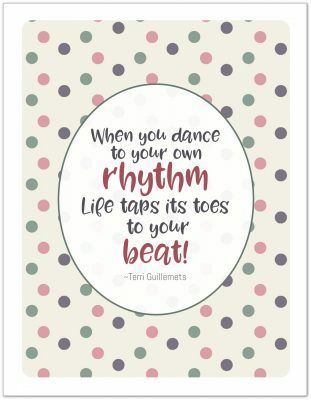 When I found your printables, I did the happy dance! Your forms work like my head does! I find that the right colors will “invite” me to use the forms. I also noticed that the layouts just work so well for me that I return to your site time after time. I like the way you think when you are designing your forms. Colorful enough to be enticing, but straightforward enough to be totally useful. You go, Alli! Thank you so much for your kind words Dianne. I am so happy to hear that you are finding the printables useful. Life with ADD can be tricky, but with a few tools, both physical and emotional/mental it can also be wonderfully freeing. I use a weekly calendar for my day to day appointments and tasks. However, I would like to start a planner for my crafts, mostly knitting, crocheting and needlepoint. I would like to use a 3-binder so that I also could place my patterns in them and it would be easy for me to move them to different sections. That sounds like a great idea Betty. I don’t know if it would work for you or not, but you could try setting up simple sections, like crochet, knitting, and needlepoint, and then a section for what you’re currently working on. Avery makes repositionable tabs that you could use to separate projects by kind of craft if you work on more than one at a time and would like to have that extra layer of organization. This nice thing about making your own is that you can build it slowly, bit by bit, and change your system as you need too.